The Housing Justice for All coalition and Upstate Downstate Housing alliance held a major rally and march in support of the fight for Universal Rent Control, which will continue to ramp up until rent laws expire in June. At least 167,000 apartments have been deregulated in the past 26 years due to a loophole that permits landlords to remove a unit from rent regulation as long as they invest in short term renovations. Housing activists hope to close this loophole, among others, when the State’s rent laws are up for renewal in June. Assembly Member Joe Lentol (District 50, Greenpoint) and State Senator James Skoufis (District 39, Orange County) introduced a new bill, supported by AirBNB, to regulate “homesharing” in the state. AM Lentol previously introduced a weaker bill almost entirely written by AirBNB lobbyists that failed to pass in 2017. Gothamist and NYT had coverage of the opaque and frustrating process that led to the passage of the state budget. 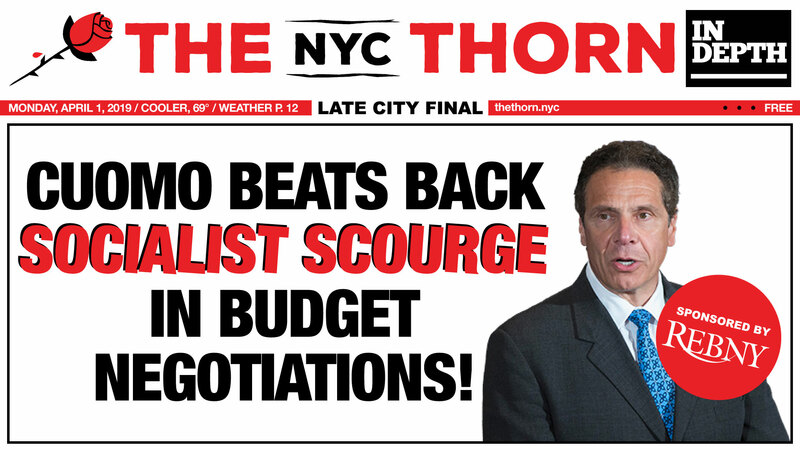 While the budget had some higher profile progressive wins like congestion pricing and criminal justice reform, Cuomo forced concessions and watered down proposals into the final product at the eleventh hour, outraging many progressives in the Legislature. There are discussions to alter the budget making process to prevent the Governor from inserting policies into the budget at the last minute under threat of government shutdown. Gotham Gazette has a preview of the key issues in Albany’s post-budget legislative session, including rent law renewal, marijuana legalization, the New York Health Act, and the Climate and Community Protection Act. Cuomo and the State Legislature agreed to an annual state budget that included implementing congestion pricing in Manhattan, a reduction (but not elimination) of cash bail, and a plastic bag ban across the state. A pied-á-terre tax was killed thanks to real estate industry lobbying, but a mansion transfer tax that mandates a one-time levy on expensive home sales was included in the final budget. The budget excluded any provisions surrounding the legalization of recreational marijuana as well as public campaign finance, but included the establishment of a commission to study the latter. Of the 895 spots in Stuyvesant High School’s freshman class, only 7 were offered to black students. Other Specialized High Schools did not fare much better. African-Americans represent over 1/4 of the City’s population. The over 10,000 nurses at the New York-Presbyterian, Montefiore, and Mount Sinai hospital systems who had threatened to go on strike are now putting the plan on hold. NYSNA said after six months of negotiations, progress has been made toward a possible settlement with management. However, the NYC-DSA’s Labor Branch will be holding a solidarity kick-off party and strike fundraiser with several NYSNA organizers on April 1 in case a strike proves necessary. Rep. Gregory Meeks (NY-05) was elected to replace former Rep. Joseph Crowley (NY-14) as boss of the Queens County Democratic Party. Meeks, an ally of Crowley and the establishment, has been plagued by corruption allegations of accepting improper gifts and spending frivolously on travel using campaign funds. De Blasio’s 2020 city budget proposal includes hiring freezes and significant funding cut to HPD due to fears of loss in tax revenue. While Governor Cuomo is calling on the State Legislature to include marijuana legalization in this year’s budget, some county executives, including Nassau County’s Laura Curran, have indicated that they would opt out of any statewide law permitting the sale of recreational marijuana.